The Connemara marble that is featured in this shamrock bracelet is the only natural green marble in the world; fittingly, Connemara marble is only found in Ireland. 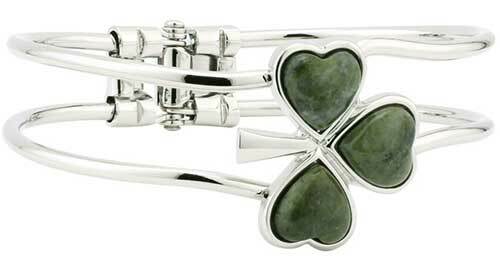 This Connemara marble bracelet features a shamrock that measures 7/8” wide x 1" long and is enhanced with inlaid stones. This heavy weight hinged bangle is gift boxed with shamrock and Connemara marble history cards, complements of The Irish Gift House. 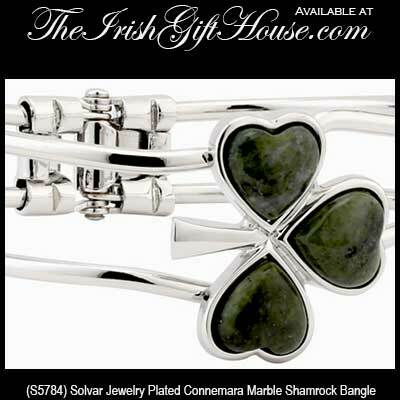 The rhodium plated shamrock bangle will fit most women's wrists and it is made by Solvar Jewelry in Dublin, Ireland. Shamrock pendant features a rhodium plated finish along with leaves inlaid Connemara marble. Connemara marble bracelet is a hinged bangle design that features a rhodium plated finish.